MTI’s 357 Strength Progression deploys a version of our TLU Strength progression paired with complementary short, work capacity efforts to elicit a “hormonal” flush in athletes, in quicken strength gains. This is and advanced program design course is designed for professional strength and conditioning coaches, personal trainers and advanced athletes interested and ready to learn advanced program design. 357 Strength session design was initially developed in 2011 to prepare an athlete here in Wyoming for a Crossfit competition. It combines elements of our TLU strength session design and with complimentary work capacity efforts in the same training session. The complimentary work capacity training is reported to have a“hormonal flush” effect, forcing the body to overcompensate and therefore decrease recovery time. Train total body, lower body and upper body strength exercise. This is where “TLU” in the name for this design. Train one exercise at “heavy” intensity, one at “moderate” intensity. Use total exercise volume to dictate intensity. In conjunction, each lifting session is followed by a short work capacity session varying in time. As the title “357” implies, each week has a work capacity session that is either 3 minutes long, 5 minutes long, or 7 minutes long. These work capacity efforts are what create the “hormonal flush,” meant to decrease recovery time. We’ve completed the 357 Strength progression with a wide array of total, lower, and upper body strength exercises – all with good effects. 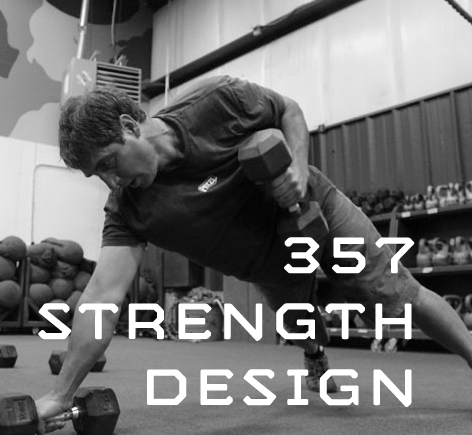 357 Strength design can be easily implemented with barbell strength exercises. By the end of this course, you will be able to apply this methodology to one exercise in any cycle, or in a focused, strength cycle.